The 4th of July has come and gone, but the backyard parties aren’t going anywhere! What’s not to love, right? Well, for many of us summer is the incentive to get into shape and start looking our best. But then along come the parties and the bbqs–which are great, but not so great for squeezing into that new swimsuit. You don’t want to be left out of the fun, but perhaps you would also like to avoid all those extra calories. Can you have your cake and eat it too? The answer is “YES!” With a little planning and the help of these delicious, guilt-free summer bbq recipes you can throw the best bbq around. When it comes to choosing your summer grilling recipes, the main course can be your worst nightmare. A typical summer bbq menu often has a heavy meat option front and center. Greasy cheeseburgers, hot dogs, and fatty bbq sandwiches are the popular go-to choices. But the worries don’t stop there–the sides can be just as dangerous as the main course. Bbq sides are usually packaged junk foods like chips, or they’re homemade, yet notoriously heavy and laden with mayonnaise. 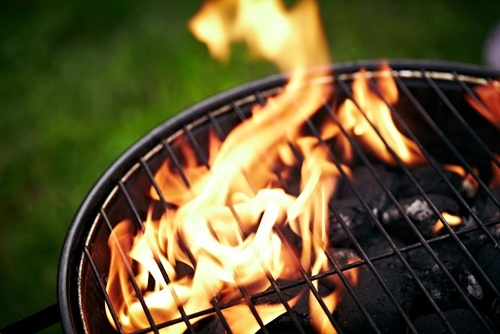 Check out these summer barbeque recipes that will satisfy your guests’ appetites and keep you feeling great. For a fun, colorful option try a shish-kabob recipe. Not only do you pack in some nutritious fruits or veggies, but you can make the meat portions smaller without feeling skimpy. Round out the meal with a corn and black bean quinoa salad. Surprise your guests with a fun twist on a staple with this chipotle mango bbq chicken recipe. With the sweet mango and the spicy chipotle, people won’t be able stop talking about your cook out. Choose chicken breast over dark meat for an even lighter, healthier meal. Pair with a fresh, bright tomato salad. This might sound too good to be true, but this bbq sandwich recipe lets you splurge on good conscience. The substitution of lean turkey meat for the usual fatty pork or beef means you get all of the delicious tang of a bbq sandwich without the guilt–this is definitely one to add to your summer bbq recipes. Skip the usual heavy, mayo-soaked coleslaw and try this much healthier spicy-sweet slaw for the perfect bbq pairing. With these delicious, light summer bbq recipes you can face bbq season and swimsuit season without fear. Embrace the fun of a summer cookout and still feel good afterwards!